At FirePlug we are specialists in fire and acoustic products, but when it comes to our intumescent door seals we really are one of a kind. 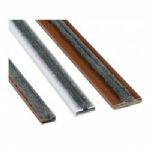 Intumescent door seals, sometimes known as intumescent door strips or smoke seals, are used in passive fire protection, for fire doors. A common sight in large buildings, they prevent fire spreading from room to corridor and are in place to protect occupants of conjoining rooms from such things as smoke inhalation. Look at the top and sides of any fire door and you will clearly be able to see routed into the grooves, an intumescent strip or seal of some form. Intumescent materials are used for many different types of fire protection products. An intumescent is a substance that swells when exposed to heat, thus increasing for example, the volume of the fire door seals and decreasing the density. All fire doors have to be fitted with an appropriate intumescent seal. This can be a time consuming and costly job, involving tradesmen having to chisel away at doors to get the seals to fit perfectly. Fire plug, however, now make this even easier. We manufacture our very own intumescent door strips in house. Meaning you can complete this task yourself with ease. Our intumescent door strips and smoke seals come in many different shapes and sizes, whether you want to add a fire door seal to a single or double door, we have the right door strips for you. 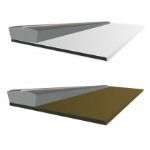 Each intumescent door strip comes in an array of sizes and colours and complete with an adhesive backing, allowing you easier application to the fire door, thus saving you time, money and most of all resources. We also cater for fire doors that require upgrading. We have available a range of retro fit surface mounted door seals, these seals are not rebated just simply stuck to the door frame.